I am in love with this velvet trend. What about you? Velvet is so on trend right now. 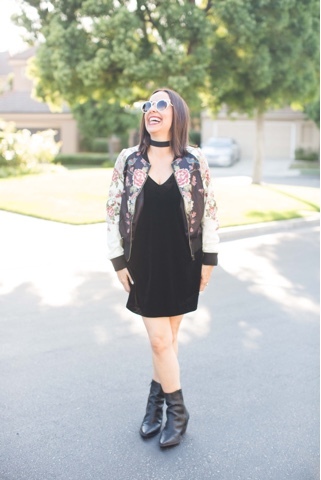 I love this little black velvet dress from one of my favorite boutiques Style Society. 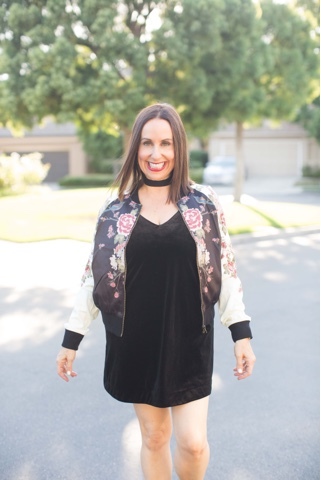 I decided to pair it with this adorable floral bomber jacket (also from Style Society) and my fave Matisse booties. This outfit is so perfect for that fun girls night out!! I love printed bomber jackets. They are the perfect alternative to your more traditional blazer or leather jacket. I am also obsessed with these Quay sunnies!!!! I love this Australian line and they are so reasonable. And of course I had to complete the look with my favorite choker and a great red lip. I hope you invest in a great velvet piece for this season. What so you think of this trend? Thanks to Taylor Cole for photos and you can shop this look by signing up @liketoknow.it or clicking on these links above. Happy reading!!! !